This is not a full car review. Rather, this is a description of how the Lexus IS350, rear wheel drive sports sedan compared to the BMW 335i with rear wheel drive on a closed autocross style course. The Lexus IS350 has been very carefully updated for 2014 and Lexus has addressed what many saw as shortcomings. The biggest change is the styling. Much more aggressive than before, the side view is very handsome if you are a fan of the Lexus design language. From the front, the new spindle grill is well integrated. The IS350 F-Sport version has an “in-your-face” ginormous rendering of that theme. Critics can now call the Lexus IS 350 styling anything they want to except boring or conservative. The BMW looks good to our eye, but not a car we would speed up in traffic to get a better look at. Both the 2014 Lexus IS350 and BMW 335i offer six-cylinder engines with about 300 HP. However, the BMW needs 2 turbochargers to make that power. The Lexus is not turbocharged. That made all the difference on the three courses we drove the car on. The BMW’s turbos lag, and when you take your foot off the gas and then floor the accelerator, there is a full second of not much at all in the BMW. Then BOOM! The turbos come on. However, you may need to turn by then, so the driver never gets the power. The Lexus lunges off the line with much more linear power. On a long stretch of road with no turns the BMW will beat the IS350. However, for about half the cost you could buy a Camaro SS that will beat the BMW in that single contest. Sports sedans are not drag racers (only). Turbo lag was not the worst problem with the BMW. When you throw the BMW from side to side in aggressive driving the stability control nanny comes on too strong, too fast, and then won’t give you the car back. It retards the engine way too long. Longer than any car at the event (Audi, Mercedes included) and you sit there saying, “where is the power.” When it does come back you then still have to wait for the turbos to spool up. Other participants of the event noticed. Many not used to turbocharged cars were shocked. Yes we had both cars set to the appropriate settings. 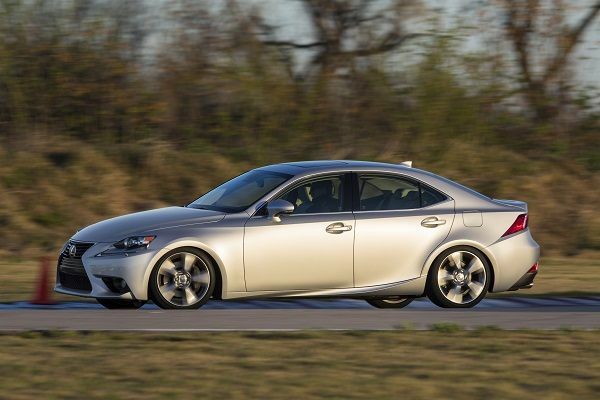 The 2014 Lexus IS350 danced from cone to cone, very neutral in its turning. In terms of handling the BMW understeers so shockingly you would think it was a front drive economy car. The BMW under-steered its way through the course from start to finish. Meaning it plowed. Why buy a rear-drive sports sedan if it is going to plow when pushed hard by the driver? The IS350 on stock tires can be made to rotate the tail out a bit. The IS350 F-Sport has more tire, on lower profile rims of greater diameter. For us, the non-F-Sport variant is the clear choice. The bottom line is that the BMW has much going for it (of course), but it is not a car that is suited to aggressive driving on a closed course. The new Lexus IS350 is a car that feels sporty and tossable. Motortrend recently compared a $62,000 BMW 335ix to the $49,000 Lexus IS350awd. They picked the BMW as the winner, giving little in the way of points to the 20% cost differential. Our own Patrick Rall also tested the Lexus recently, and you can read his report at Torque News. Please note: The video, courtesy of Youtube.com and LexusISRideAndDrive, shows the shortest of the three courses we drove to test the vehicles.